Pauley James Former Foster Baby: Updates: Good News All Around! Updates: Good News All Around! Paige nka Lily has been adopted!!! She was in foster care here in KY for 6 months. She went to Tara’s House in MD & was adopted after 2 weeks!!! Katie has been adopted too!! She was in foster care in KY for 8 months. She went to North Star Dog Rescue in VT & was adopted after 2 weeks!!! Katie now lives with a retired couple with a 40 acre farm. Think they might want to adopt me too?! Just kidding, I would really miss my boy.It really makes me happy knowing that Katie & Paige will be spending their Christmas in warm LOVING homes! My former foster brother, Jiggs has an ADOPTION PENDING!!! Mrs. got an update on Shirley (we are so happy that we get these) & she is doing great & is still as sweet as ever. 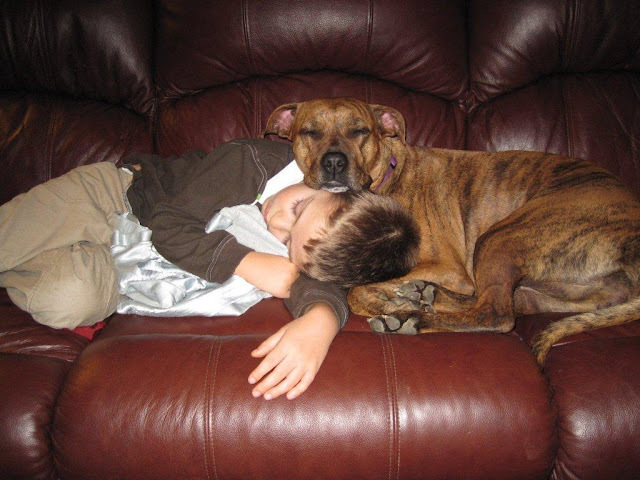 Shirley’s mama was also nice enough to send us a picture to share of Shirley & her boy taking a nap. Can't you just feel the LOVE? Thank you Shirley's mama (& the rest of the family too)!!! I am still feeling good & all of my stitches are healing up nicely. Everyone keeps telling me how much better my breath is now :) It has been rainy here & me & my boy have been doing a lot of sleeping. I wonder when the boy will put a stop to putting pics like this up? Tomorrow we will be picking a winner for our ZippyPaws giveaway. Make sure you enter here. Later in the week we will post pics of a very special visitor we had & then if all goes as planned, we will have 2 HUGE announcements. That is wonderful news on all those pups! Esp about Shirley. Im glad that you are feeling better and you and your boy look so happy together! Adoption pending for Jiggs too? That's great! Hoping the best for him, he has waited quite awhile! So many happy dogs, so many happy homes for the holidays. That's a lot of movement, and such great news all around! Awww...I love happy endings (or beginnings) and happy updates. As for boy, I hope he always lets you post pics of 'Pauley James and His Boy' - they always make me smile. And now I shall be sitting on the edge of my chair waiting for your two huge announcements - you tease! Raise money for STAR - Saving the Animals of Rowan (Morehead - KY) just by searching the web and shopping online! Dog World Records Graphic created by Pet365 – click to see the full size version.